This year’s Historical Materialism conference in London seemed well attended and with younger participants. HM covers all aspects of radical thought: philosophical, political, cultural, psychological and economic. But it’s economics that this blog concentrates on and so my account of HM London will be similar. Actually, there did not seem to be as many economic sessions as in previous years, so let me begin with the ones that I organised! They were the two book launch sessions: one on the new book, The World in Crisis, edited by Guglielmo Carchedi and myself; and the second on my short book, Marx 200, that elaborates on Marx’s key economics ideas and their relevance in the 21st century, some 200 years after his birth and 150 years since he published Volume One of Capital. As the preface in the book says: World in Crisis aims to provide empirical validity to the hypothesis that the cause of recurring and regular economic crises or slumps in output, investment and employment can be found ultimately in Marx’s law of the tendential fall in the rate of profit on capital. My power point presentation showed one overall result: that wherever you look at the data globally, there has been a secular fall in the rate of profit on capital; and in several chapters there is evidence that the causal driver of crises under capitalism is a fall in profitability and profits. In the session, Tony Norfield presented his chapter on derivatives and capital markets. Tony has just published his powerpoint presentation on his excellent blog site here. Tony traces the origin of the rise of derivatives from the 1990s to the instability of capital markets. Derivatives did not cause the global financial crash in 2008 but by extending the speculative boom in credit in the early 2000s, they helped spread the crash beyond the borders of the US and connecting the crash in the home markets to mortgages, commodities and sovereign debt. Tony argued finance is now dominant in the controlling and distributing value globally but that still does not mean that finance can escape the laws of motion of capital and profitability. On the contrary, finance intensifies the crisis of profitability. So, in policy terms, acting to regulate or take over banking and finance will not be enough to change anything. Brian Green stepped in to fill the slot for my fellow editor Guglielmo Carchedi who was unable to make the session. Brian offered an intriguing new insight on how to measure the rate of profit on capital that could include circulating as well as fixed assets. 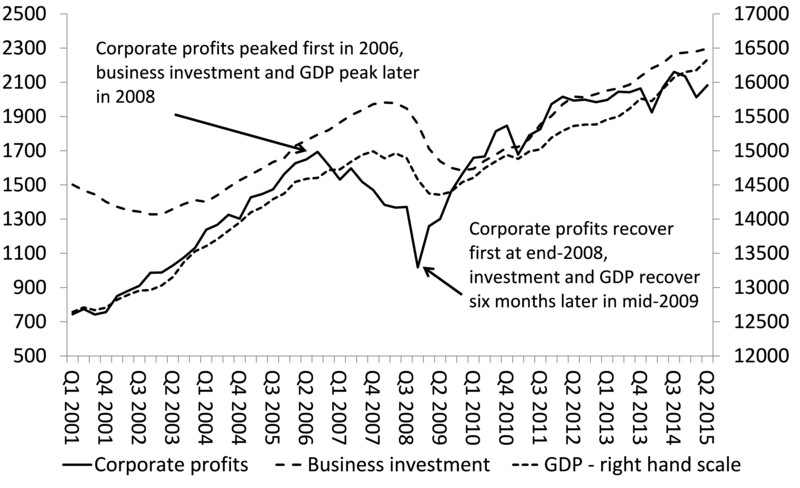 Most Marxists consider that it is impossible to properly measure circulating capital to add into the denominator in Marx’s rate of profit formula (s/(c+v) Brian offers a method using national accounts to achieve this and, in so doing, he argued that a much more precise measure of the rate of profit can be achieved that will enable us to see more accurately any changes in profits and investment that would lead to a slump. Some important questions were asked by the audience. 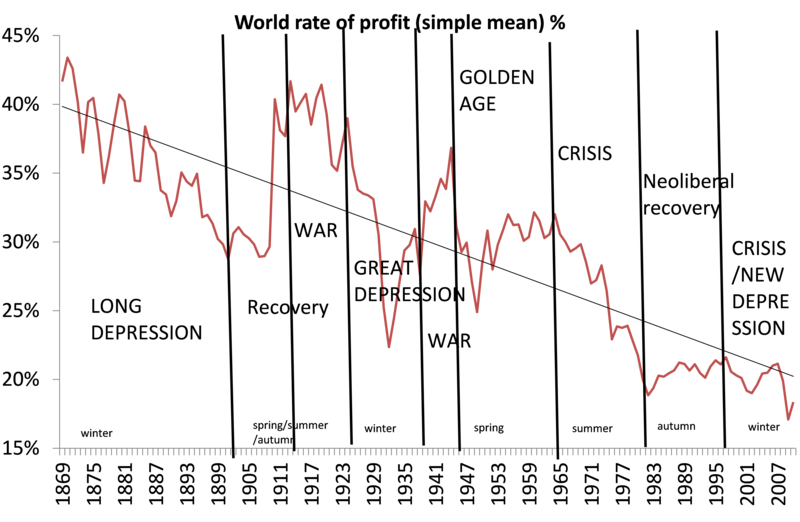 In particular, how can we connect Marx’s law of profitability (the rate of profit) with crises based on a falling mass of profit? In Chapter One of the book, Carchedi and I show just that: that a falling rate of profit eventually leads to a fall in the mass of profit (or a fall in total new value) which triggers the collapse in investment. Indeed, contrary to the view of Keynesians that a fall in household consumption triggers a crisis, it is investment that swings down, not consumption. In the Great Recession, profits led investment which led GDP; consumption hardly moved. 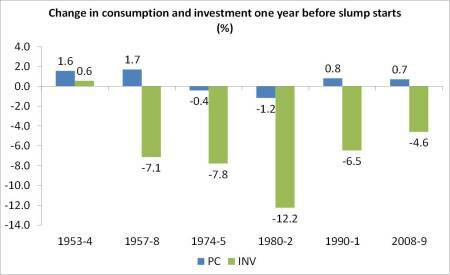 Here is a graph showing the change in investment and consumption one year before each post-war slump in the US. Another question was: why do bourgeois economists find a rise in the rate of profit from the early 1980s if Marx’s law is right? The answer is two-fold: first, while Marx’s law holds that there will be a secular fall in profitability, it will not be in a straight line and there will be periods when the counteracting factors (eg. a rising rate of surplus value) to the law as such (a rising organic composition of capital) will be stronger. And second, this was the case for the so-called neoliberal period from the early 1980s to the end of the century. 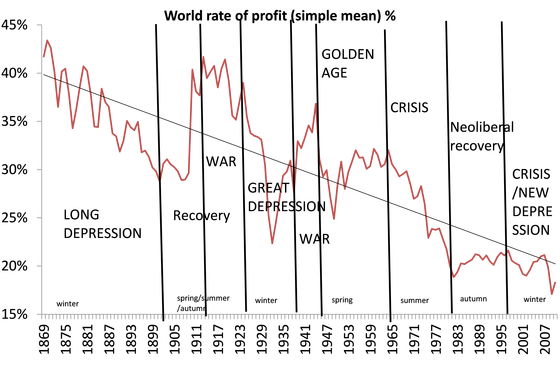 So mainstream measures, which always start at the beginning of the 1980s, miss part of the picture. Naturally I disagree. It seems to me that ‘scientific socialism’ is just that: a scientific approach to explaining the irreconcilable contradiction within capitalism and why it needs to be and must be replaced with socialism if human society is to progress or even survive. Marx recognised the role of empirical data in his backing up his theories and often attempted with the limited resources at his disposal to accumulate such (in Capital and elsewhere). We cannot just assert that Marx’s laws of motion must be right because there are recurrent crises in capitalism – we have to show that it is Marx’s laws that lie behind these crises and not other explanations. If correct, other explanations might (and do) mean that capitalism just needs ‘modification’ or ‘management’ (Keynes) or even better left alone (neoclassical and Austrian). It is not determinist to argue that economic conditions are out of the conscious control of both capitalists and workers (an Invisible Leviathan) and the law of motion of capitalism will override the ability of people in struggle to irreversibly change their lives – without the ending of capitalism. Class struggle operates continually, but its degree of intensity and the level of success for labour over capital will be partly (even mainly) determined by the economic conditions. “Men make their own history, but they do not make it as they please; they do not make it under self-selected circumstances, but under circumstances existing” (Marx). A number of other important issues were raised by the audience: what about the three laws that Uno Kozo, the Japanese Marxist economist identified? I cannot answer this one but there was a session at HM on just that with Elene Lange. The other question that came up was again whether Marx’s law of profitability was really just a secular theory (ie long term) and basically irrelevant as offering any underlying cause of recurrent crises; or whether it was just a cyclical theory, explaining the ‘business cycle’ or ‘waves of capital accumulation’, and has nothing to say about the eventual demise or breakdown of capitalism. It was Rosa Luxemburg’s view that it was the former – a very long-term tendency that was so long term that the ‘sun would burn out’ before a falling rate of profit would play a role in pushing capitalism into crises (Luxemburg made this remark sarcastically in reply to a Russian economist who suggested that Marx’s law of profitability might well be relevant). On the other hand, many Marxist economists who do accept the relevance of Marx’s law of profitability in recurrent crises deny that it offers a prediction for the transient future of capitalism (ie capitalism cannot last forever). In my view, the law is both secular and cyclical and I present arguments for this view in my book, The Long Depression. And in the new book, The World in Crisis, there is evidence of both the secular view (Maito) and the cyclical view (Tapia). I shall be returning to these topics on my blog over the next period. Finally, there was the Isaac Deutscher Memorial Prize awarded at HM for the best Marxist book of the year. Last year’s winner was William Clare Roberts for his intriguing Marx’s Inferno: The Political Theory of Capital (Princeton UP). For my initial thoughts on this work, see here. But last week, after hearing my namesake speak on the subject of the nature of freedom under socialism, I shall be returning to this subject in a future post.